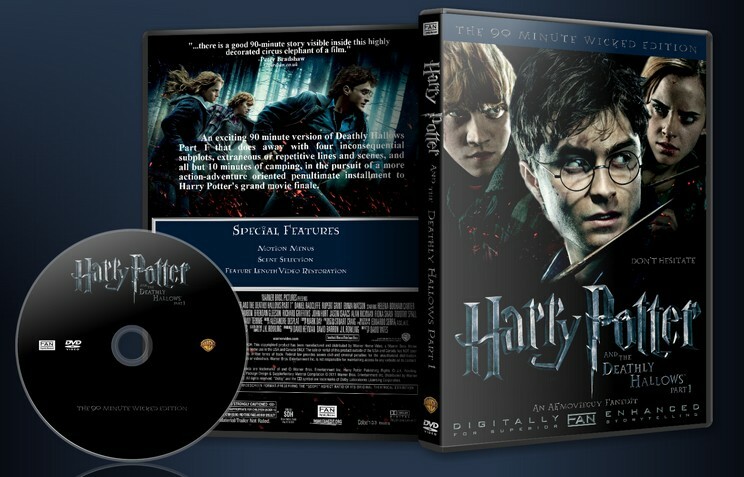 A focused, more broadly entertaining Deathly Hallows Part 1 narrative, satisfying casual fans of the Harry Potter movie series and maintaining its opening Act’s momentum. A more magical, action-adventure cut, as opposed to the original’s more introspective approach. To be considered as the first exciting 90 minute hook of a three and a half hour single film narrative. - Video Levels adjusted to better match the prior films in the series. - New Opening: Snape’s meeting in Malfoy Manor opens the film. a. Ron’s struggle is now an internal one, dealing with his sense of self-worth compared to Harry and Hermione, both of whom now quickly figure out 3 of Dumbledore’s clues and carry the team through the first half of the film. Ron begins to naturally feel guilty (not angry) about being a burden for Harry and Hermione. The Locket scene is where Ron proves himself a valuable member of the trio; a figurative ‘return’ to form. - 10 minutes of Camping/Middle restructured: Only 10 minutes of camping separates the end of the ‘Ron Splinched’ scene and the beginning of the ‘Silver Doe/Locket’ scene. All lines directly referring to excised scenes (Bathilda Bagshot, Godric’s Hollow, and Ron Leaving) and important plot points to the narrative of Part 2 (such as, “I open at the close”) have been fit within the new continuity. - Snatchers are no longer smarter than Bellatrix and the Malfoys when it comes to recognizing Harry. - Scenes are cut that didn’t work (Zipping up Ginny) and/or that are unnecessary/over-explanatory/retreads (Ron confronts Harry at the Burrow). - Cut Harry’s first “no,” in reference to the polyjuice. - Tightened: Whole Ministry of Magic sequence for added humor, urgency, and tension. - Reworked: Harry and Hermione discuss “I open at the close” on the way back to the tent, and Hermione reveals that she found a symbol inked into “The Tales of Beetle the Bard.” All the while, Ron begins to feel worthless and lies down. - Reworked: Radio montage now comes after they find out the purpose of the sword. - Added: Shots of Harry seeing “Dumbledore” in the mirror shard and Hermione leaving her perfume-scented scarf wrapped around a tree during the Radio Montage. -Reworked: Radio Montage ends after Harry overhears Hermione’s “None of us do” line, and the scene cuts to their new tent sight in the snow after the locket noise peaks. -Reworked: The tent in the snow fades to black. -Added: Dumbledore falling flashback during faint “trust me,” before cutting to Harry in the Silver doe scene. -Reworked: 2nd half of the Locket Confrontation completely reworked so that the naked make out illusion is a last chance effort to sway Ron when he’s already begun to charge, alleviating the gratuitous impression given by the 5 second lingering in original scene. Locket now grows desperate after Harry yells. “Ron it’s lying,” and the scene is tenser due to uncertainty of if Ron is about to kill Harry. - Reworked: Removed references to Ron’s return during the following scene where Harry and Ron show Hermione the destroyed horcrux. Hermione is now agitated due to her jealousy with the ‘coincidences’ which allowed Ron and Harry to find and destroy what her logic and time could not. Plus, Ron was supposed to still be sick. - Added: Ron now says “Always the tone of surprise” at the end of telling Hermione about destroying the locket (a callback to the two times they said it to each other previously in the film). - Cut Ball of Light conversations, but kept the shooting flame in the latter scene. -Reworked: Bellatrix now exclaims “NO…” instead of “Get Draco…” And the following scene starts with Draco’s “What’s wrong with his face,” followed by Bellatrix’s “A stinging jinx… was it you, dear! ?” Smarter Villain=More imposing. - Reworked: The music now drowns out Dobby’s “Harry Potter;” scene changes before Luna kneels by Harry. - Reworked: The music now peaks right as Voldemort fires his lightning into the sky, making it feel more climactic. So, I watched this today (AVCHD, stripped down to just the movie file to watch in my HTPC, so sadly I’ve missed out on all the cool extras). Video is crisp and good, but some compression artifacts are present on dark areas, but doesn’t bother me much, however, the scene in the Malfoy’s basement felt a bit too bright and sunny considering the situation. 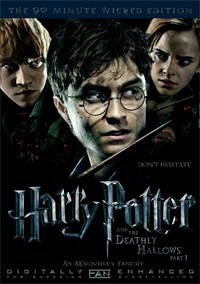 * The Harry Potter title appeared twice (just before Snape enters the story and after Nagini has a snack). The second one felt redundant. * I loved how a bitter Ron turns of the light in the tent, cutting short Harry and Hermiones discussion about the sword of Godric Gryffindor and his line afterwards then a swift cut. As a fan of the book, I prefer the theatrical version, but for a quick fix or paired with a shorter part 2 this edit is excellent. I give this a 9.5/10. 1) I think the Lumos! extra feature was my favorite part! The creative fun you had with it really showed. It also technically impressed me. I’m still not really sure how you fluidly worked the split screen like you did! And it was set brilliantly to the chosen music. 2) Presentation-wise, this fanedit is brilliant. The menu and extras (including the hidden easter egg video) is fantastic! AEmovieguy is definitely not short on creativity. 2) As far as the movie goes, I was pretty excited about the plan for this edit. After watching it, I had two separate feelings. For me personally as someone who is familiar with the book and theatrical release I was overall grateful for the cuts made, glad it was shorter, and sometimes wishing it were even shorter yet. But simultaneously I couldn’t help but feel that perhaps he cut too deeply unnecessarily in some scenes at the cost of character, story development, and dramatic tension, and not enough in a couple spots surrounding your camping cuts where the characters’ reactions now don’t make sense. (There were also a couple awkward fades in the camping stuff.) I fear that someone watching this who had never seen the original or read the book would be very confused and feel that the movie felt disjointed. This seems to be one of the more challenging concepts with fanediting. Because of the audience here, faneditors can often get away with leaving certain character or story threads a little splinched, but when taken in as an original story and graded soley on its own merit, critics would probably respond less favorably. 3) I watched the AVCHD version. The audio sounded excellent. Strong work there. Visually I suspect this edit looks great on DVD. On AVCHD it doesn’t look bad per say, but just not as good as it could given the blu-ray source. This is more apparent in some scenes due to your adjustment to the luma levels, but that color correcting effect seems to just be enhancing some other underlying compression or resolution data loss that occurred prior to applying the effect. This is evident in the Lumos extra video comparing both versions side by side. With all that in mind, I rated this edit 7/10. AEmovieguy put an impressive amount of work into this and it shows. It is not perfect in my opinion, but it is well worth the time to watch for anyone like myself who felt the source material for this story was flawed and who does not want to see an exact reproduction of The Deathly Hallows book. In my eyes Harry Potter 7 (and probably 8 as well) was the victim of fanboys having too much influence on the creative process – resulting in a product tailored for the bean counters that don’t realise that a good adaption is never a scene by scene recreation of the book or that faithful is not equal to following every tiny detail. Because of that Deathly Hallows while enjoyable never reached the status of a truly marvelous adaption that could stand on it’s own two feet. AEmovieguy delivers the closest thing we will probably ever get to this: a fast paced version of a movie that should have never been split apart. I think the sequence would work better if the discovery of the symbol would be moved between the sequences of travelling through britain.